Welcome to the new CKS Marketing Communications website! 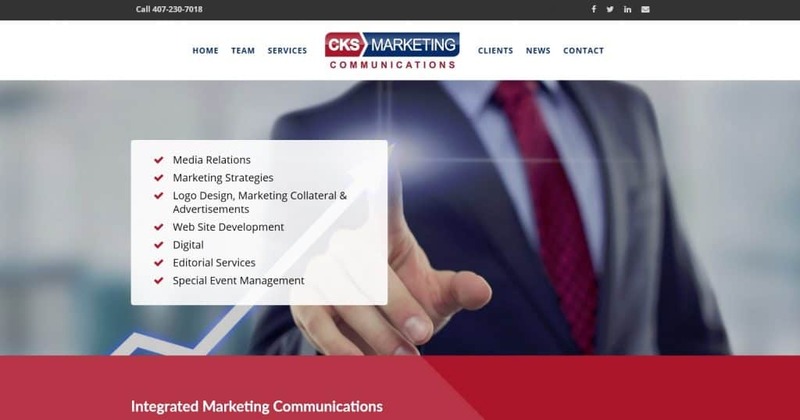 Welcome to the new CKS Marketing Communications website! This transformation has been in development for several years. While we’ve been busy helping to raise the profile of our clients or assisting with their special projects, we have delayed the development and production of our own website. Now that we have had the time to focus on our needs, the end result is a more updated, dynamic and responsive website. We welcome you to connect with us and to read more about our clients and their exciting news or accomplishments. We also hope to provide you with relevant information on best practices or industry trends, serving as your resource for expert marketing communications! As an added resource – we wanted to provide some tips on what elements should be incorporated when developing a website. Dynamic brochure – Keep in mind that your website is your interactive brochure. It should be eye-catching, intuitive and designed with the user experience in mind. Information should not be buried but it should foster a call to action. Direct potential customers through the flow of information and ensure that links work, information is current and contact information is easy to find. Forms can be used for inquiries and newsletter sign-up buttons etc. can be added to capture potential customers. Don’t forget to include social media links as well. Built within Reason – Websites don’t need to cost a fortune – a good web developer knows how to properly optimize and tag the website ranging from backend information to keywords. Websites that come in a box – set at an extremely inexpensive price come with their own set of limitations such as not owning the site (due to hosting) or on the flip side – should not cost tens of thousands of dollars (for a basic site). Always be sure to check references and do your homework. Attractive Design – Eye-catching graphics and innovative design – websites should be responsive. With a content management system (CMS), it offers for flexibility for in-house management versus outsourcing and less time to make edits due to the use of style sheets and themes that are built with editing in mind. Use of color, high-end photography and positioning is key. K.I.S.S. – Keep It Simple Stupid – the acronym stays true when considering that content and flow your site should have. Intuitive design allows the customer to find what they need without information being buried or hard to find. Navigation should flow and content should provide helpful information, but also drive the user to the call to action. Optimization – it is important to ensure that once a site is designed that it is also properly tagged and optimized for SEO. Many developers claim to be able to develop websites, but often times they are not properly configured in the back end which doesn’t result in driving traffic and potential customers to engage. We hope you found this information helpful. Be sure to check back for further information and marketing tips. What is the Significance of Traditional PR? Do Press Releases Really Work?